We’ve all got our own work Christmas party stories, but how many would you rather forget? 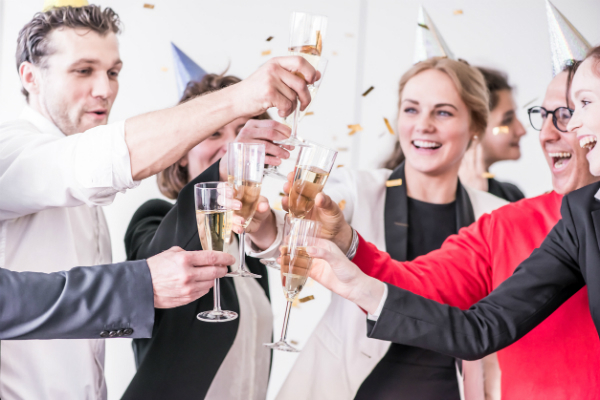 As an employer, you might be feeling uneasy about what you can be held liable for when it comes to staff behaviour at the party, and you’ll no doubt be keen to avoid any problems. The following pointers should help to make it a night to remember for the right reasons! Are employers liable for behaviour at a work Christmas party? In short, yes! A work Christmas party is a work event, so it’s considered – in the eyes of the law – as taking place ‘in the course of employment’. Therefore, as an employer, you can be held liable for the behaviour of your staff. So you definitely want to take all reasonable steps to prevent any misconduct. How do you prevent problems such as staff misconduct at the office party? It’s a good start to make sure your staff understand that the party is related to their role in your company – it’s not just a night out with their mates from work. It’s been organised for the whole business to enjoy. You should be proactive and state clearly that it’s a work event – sending an email around to all staff notifying them about this is a good idea. You may want to remind them about the consequences of poor behaviour, and that you expect them to be in on time the morning after, if they’re due to be working, and what actions will be taken if they fail to do so. Make sure your policy on workplace social events is up-to-date (or write one if you don’t have one yet). It needs to state clearly the type of behaviour which staff would face disciplinary action for. Can you discipline staff for misconduct at a work Christmas party? Yes. And it’s important to make your staff aware of this. When it comes to the party itself, don’t leave problems to develop. As soon as you see something happening, step in and try to solve it or stop it. And make sure your senior managers know to do the same. The last thing you want to hear is that they saw something and did nothing about it. You don’t necessarily need to start a disciplinary procedure for every little incident. If someone just got a little too carried away with the Christmas cheer perhaps just have a quiet word later on. But serious issues of inappropriate behaviour or misconduct should, of course, be followed up properly. In the instance that someone makes a complaint about the behaviour of another member of staff, you should address this immediately and follow your grievance policy. Here it’s important not to dismiss it as a one-off or put it down to an alcohol-fuelled misunderstanding. Unless you formally investigate you won’t be in a position to show that you have taken steps to prevent any ongoing harassment. This would leave you at risk of an employee bringing an employment tribunal claim for failing in your duty to protect them from harassment by their colleagues. When you’re planning for the party, make sure you take into account your responsibilities to your staff. It’s important to ensure the event is inclusive to all. You’ll need to think about making sure the venue is somewhere that all will enjoy and that the content of the party doesn’t centre entirely on alcohol. Be sure to provide non-alcoholic drinks and that your menu options cater to all dietary requirements. A good thing to do is to plan a time that will limit drinking prior to the actual party. After all, you don’t want staff turning up in a state when you’re about to have a sit-down meal. Limiting the open bar and providing transport home are two things that should also be added to your list of priorities. They may seem minor, but they help to keep your staff safe and happy. While your Christmas party is likely to be more about celebrating your staff and their work throughout the year than celebrating in a religious context, it’s still important to be mindful of religion when making plans to ensure that nothing you organise could be considered religious discrimination. Social media can be a great way to show the outside world just how great your business can be to work for. And a Christmas party is a fun time to do this. However, it can also mean that drunken office antics quickly become the focus of internet scrutiny. As a result, you need to ensure that you make necessary preparations so your staff’s drunken tweets don’t damage your business’ reputation. Ensuring that you have the proper employment policies in place to cover you is essential in the event that a staff member posts embarrassing images, or even comments about clients. If you don’t have a social media policy, you may wish to create one, or add it to your existing disciplinary policy. In which case, you’ll need to inform your staff of the new addition to your company’s policies in writing, and tell them where they can access it. This way there can be no confusion should disciplinary action be needed. What about staff who are late or absent the day after the party? Hopefully, you’ve already reminded your staff that you expect them in on time the morning after the party. Anyone who is late, or who doesn’t turn up, should be managed in line with your usual policies for lateness or unauthorised absence. If you’d like further guidance HR issues such as employee liability or staff misconduct, or advice creating workplace social events and social media policies, get in touch on 0333 444 0165 or info@citrushr.com.